Nolan North’s life in games. There can't be many lead actors and writers in the games industry who know each other so well they practically finish each other's sentences. But then, how many can say they've been working together on their latest project almost every week since last June, let alone for large, intensive chunks of the past five years? "I think the auditions were August 2006," muses Amy Hennig, creative director at Naughty Dog, recalling the date the creator of Crash Bandicoot began casting for its PlayStation 3 debut, an all-new action-adventure called Uncharted. First and foremost, the studio needed someone to play the game's lead, Nathan Drake. Enter Nolan North. 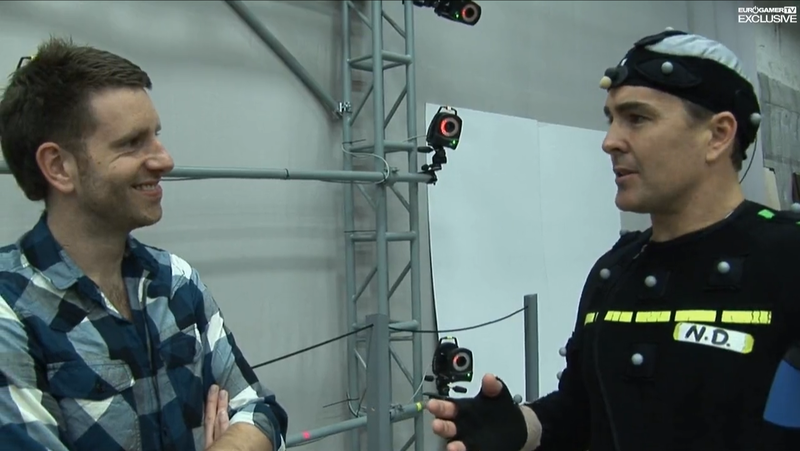 "I actually got to see the original audition for the first time right over on those couches," North reveals, pointing towards a corner of the motion-capture studio Sony has created for the making of Uncharted 3 on its production lot, a 15-minute drive from Naughty Dog HQ in Santa Monica, California. "Amy brought in her laptop, and, hey, I'm getting old," he sighs with mock resignation. "But it was funny to see how it's progressed from then to now. I'm trying to stay in the same shape..."
"No, you're in better shape," Hennig promptly retorts. And, North would argue, a better shade of work outfit. "I would never put on another brown motion capture suit," he insists. "If you've watched South Park you're familiar with Mr Hanky. That's me - just a mo-cap turd." It might look pretty, but would you care as much without the performances? If gaming has an A-list, Nolan North is firmly on it as one of the medium's busiest, most recognisable stars. But back when the actor, now 40, was a wise-cracking classroom impressionist, there was, of course, no such thing as a career in video game voiceovers. He took the well-worn route of theatre work before landing a regular role in US soap Port Charles. When work on that wound up, his agent nudged him decisively towards the now chatter-infested games industry. His turn as lovable rogue Drake propelled him to fame, and prominent appearances as Assassin's Creed's Desmond Miles, the eponymous hero of Prince of Persia and Dark Void's Will Grey are merely his best-known performances. But such success brings the very real risk of overexposure. His ubiquity has, in the wake of Uncharted 2's colossal achievement, become something of an online joke, with one gamer going as far as to produce a pair of YouTube videos entitled: "Nolan North is in EVERY game". Parts one and two, naturally. "It's really unfortunate timing as so many of those games I was the lead on came out at the same time," North explains. "A couple of them were shot way before and were held up and ended up being released at the same time." A victim of his own success, perhaps, there's little he can do in the case of a series like Assassin's Creed where "we've already established the character's voice". But the success of Drake has now afforded him "the luxury of being a little more selective with picking characters that aren't necessarily my voice, which is Nathan Drake's voice". One striking recent example is a brilliantly eccentric performance in Portal 2, unrecognisable as Nolan North until the credits roll. And one can just as easily point to Call of Duty's Dr Edward Richtofen or God of War's Hades as examples of his versatility.